I don't know why I do it to myself. I've been around long enough to have visited a few chain restaurants. I try to stay away, but every now and then I get sucked into for a birthday or as a punishment for myself. But I'll admit, today I walked into Buffalo Wild Wings for the first time, and it was of my own free will that I did so. My free will also allowed me to walk out in under a minute. You see, I became curious after seeing the commercials for Buffalo Wild Wings that are on all the time. 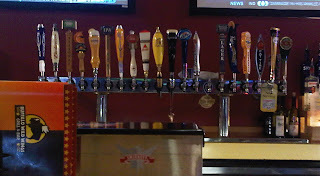 I even paused the commercials to see the shot of all the beers on tap. Looked intriguing at the time. But in real life, it became excruciating. Maybe that's a little harsh, but it was certainly a disappointment. Twenty taps stood in front of me (well, the Blue Moon tap hung limply, reminding me of my own predicament), yet none of the beers spoke to me. Actually, I think I may have heard the Sam Adams Noble Pils whisper at me to kill it, but I could have just been inhaling the smell of hot wing sauce too deeply. The other taps were all the big boys and the breweries they are in distribution partnerships with. The lone IPA was Red Hook's Longhammer...enough said. So once again, though I should have known better than to even give it a chance, I walked into, and soon out of a chain restaurant feeling ripped off, This time I didn't even have to spend any money to get that feeling. But I will never get that time back.